Materials Science and Technology, 21 (2005) 1293-1302. Download PDF file of paper together with other information. Pembroke Street, Cambridge CB2 3QZ, U. K.
Most new materials are introduced by selectively comparing their properties against those of steels. Steels set this standard because iron and its alloys have so much potential that new concepts are discovered and implemented with notorious regularity. In this 52nd Hatfield Memorial Lecture, I describe a remarkably beautiful microstructure consisting of slender crystals of ferrite, whose controlling scale compares well with that of carbon nanotubes. The crystals are generated by the partial transformation of austenite, resulting in an extraordinary combination of strength, hardness and toughness. All this in bulk steel without the use of expensive alloying elements. We now have a strong alloy of iron, which can be used for making items which are large in all three dimensions, which can be made without the need for mechanical processing or rapid cooling and which is cheap to produce and apply. It is possible to think of many ways of creating extremely strong materials. Polycrystalline metals can be strengthened by reducing the scale of the microstructure whereas single crystals benefit from perfection. Carbon-based materials can in principle become incredibly strong if the only mode of deformation involves the stretching of carbon-carbon covalent bonds. These and many other mechanisms of strengthening unfortunately have limitations. In particular, it is difficult to make strong, isotropic materials which can be used to manufacture large components of arbitrary shape, whilst maintaining an attractive combination of properties at a reasonable cost. Such a material would be commercially viable over a broad range of applications. Imagine in this context, a steel which is exceedingly strong, that can be made in large chunks, one which is easy to manufacture, and has a cost which is affordable. Before describing this novel material, it is important to review the meaning of strength, for there are many promises in the modern scientific and popular literature of materials which possess strength beyond our dreams. I shall attempt in this lecture to make appropriate comparisons to show how steels feature in this scenario. The strength of crystals increases sharply as they are made smaller [1,2,3,4,5,6,7]. This is because the chances of avoiding defects become greater as the volume of the sample decreases. In the case of metals, imperfections in the form of dislocations are able to facilitate shear at much lower stresses than would be the case if whole planes of atoms had to collectively slide across each other [8,9]. Since defects are very diffcult to avoid, the strength in the absence of defects is said to be that of an ideal crystal. In an ideal crystal, the tensile strength where is the Young's modulus. The corresponding ideal shear strength is , where is the shear modulus, is a repeat period along the displacement direction and is the spacing of the slip planes . For ferritic iron, GPa and GPa . It follows that the ideal values of tensile and shear strength should be about 21 GPa and 11 GPa respectively. In fact, tensile strengths approaching the theoretical values were achieved by Brenner as long ago as 1956 (Fig. 1a) during the testing of whiskers of iron with diameters less than 2 m [5,7]. It is interesting that these stress levels fall out of the regime where Hooke's law applies (Fig. 1b). Figure: (a) The tensile strength of whiskers of iron. 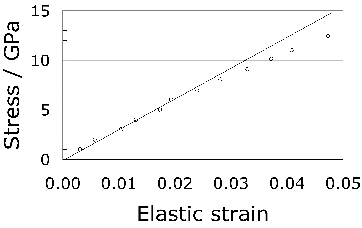 (b) Non-linear elasticity at large stresses [5,7]. The strength decreased sharply as the dimensions of the whiskers were increased (Fig. 1a), because of ``defects which are distributed statistically in a rather complex manner" [5,7]. It was therefore recognised many decades ago that it is not wise to rely on perfection as a method of designing strong materials, although it remains the case that incredible strength can be achieved by reducing dimensions, in the case of iron, to a micrometer scale. It is in this context that we now proceed to examine claims that large scale engineering structures can be designed using long carbon-nanotubes [11,12]. The existence of single-walled carbon tubes was pointed out in 1976  but the subject seems to have become prominent after the discovery of in 1985  and the identification of nanotubes by Iijima in 1991 . These tubes can be imagined to be constructed from sheets of graphene consisting of sp carbon arranged in a two-dimensional hexagonal lattice (Fig. 2, ). The sheets, when rolled up and with the butting edges appropriately bonded, are the nanotubes, which may or may not be capped by fullerne hemispheres. This is a simplified picture - it is well known that the actual form can be complex, for example with occasional pentagonal rings of carbon atoms instead of hexagonal to accommodate changes in shape . 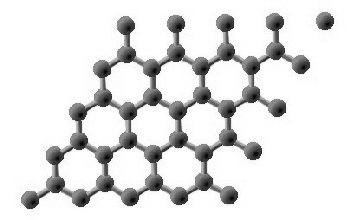 Figure: (a) A sheet of graphene. (b) Schematic diagram showing how a sheet of graphene might be rolled to form a tube . The carbon-carbon chemical bond in a graphene layer may be the strongest bond in an extended system ; carbon is also light, so it is not surprising that there are numerous papers which talk about the potential of long carbon-nanotubes as engineering materials which rival steel. The modulus of these tubes along the axis is about 1.28 TPa , comparable to that of diamond . The calculated breaking strength of such a tube has been estimated to be 130 GPa ; this number is so astonishing that it has led to many exaggerated statements which are frequently repeated and hence have taken the form of ``truth" in the published literature. For example, the tubes are said to be a hundred times stronger than steel; we have seen that whiskers of iron which are much bigger than carbon nanotubes, achieve a strength which is 14 GPa, with the potential of reaching 21 GPa. There are in the literature, bizarre statements which take no account of defects. For example, it is said that a ``macroscopic one-inch thick rope, where 1014 parallel buckywires (nanotube ropes) are all holding together" will be as strong as theory predicts, i.e. 130 GPa . Edwards  has estimated that 120,000 km gigatubes grown with the properties of carbon nanotubes are needed to construct a space elevator. He further estimates that such a cable would weigh around 5000 kg. Based on this, assuming an upper limit of eV , and neglecting dimensionality differences, equation 2 can be used to calculate the equilibrium number of monovacancies expected as a function of temperature, Fig. 3. In this, the temperature of interest is that at which the carbon is assembled; this can typically range from 2000-4000 K, giving a large number of equilibrium defects. Given that the actual value of is much smaller than the 7 eV for a flat graphene sheet , it cannot ever be assumed that defect-free gigatubes can be made with properties approaching tubes which are some 18 orders of magnitude smaller. Figure: (a) Space-elevator concept (originally due to Arthur C. Clark), requiring a cable 120,000 km in length . The cable would be launched in both directions from geosynchronous orbit at a height of 36,000 km. (b) Calculated number of single-atom vacancies in 5000 kg of carbon nanotubes. Statement 1: Systems which rely on perfection in order to achieve strength necessarily fail on scaling to engineering dimensions. Indeed, there is no carbon tube which can match the strength of iron beyond a scale of 2 mm. Although we have considered here vacancies and made many assumptions in the estimation of defect density, the fact that the measured strengths of nanotubes as shown in Table 1 are frequently much smaller than expected from vacancy models  indicates the presence of more severe defects in the atomic structure of the tubes. Table: The measured strength of carbon nanotube based ropes as a function of their length. The calculation of strength is based on the cross-sectional area of the nanotube shell rather than the actual cross-sectional area as is normal practice. In the latter case the strength of short nanotubes decreases by about an order of magnitude . The data also neglect interactions between nesting tubes in the multi-walled nanotubes studied. Suppose that gigatubes of carbon could be made capable of supporting a stress of 130 GPa. Would this allow for safe engineering design? One aspect of safe design is that fast fracture should be avoided; most metals absorb energy in the form of plastic deformation before ultimate fracture. Energy absorption in an accident is a key aspect of automobile safety. 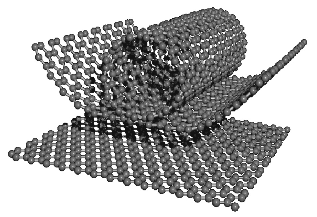 Carbon nanotubes are not in this sense defect tolerant; their deformation prior to fracture is elastic. The stored energy density in a tube stressed to 130 GPa, given an elastic modulus along its length of 1.2 TPa is in excess of that associated with dynamite, Table 2. Dynamite is explosive because of its high energy density and because this energy is released rapidly, the detonation front propagating at some 6000 m s . The speed of an elastic wave in the carbon is given by where is the density. In the event of fracture, the rate at which the stored energy would be released is much greater than that of dynamite (Table 2), meaning that fracture is unlikely to occur in a safe manner. Table: Stored energy and detonation or sound velocity. iStatement 2: Structures in tension, which reversibly store energy far in excess of their ability to do work during fracture must be regarded as unsafe. 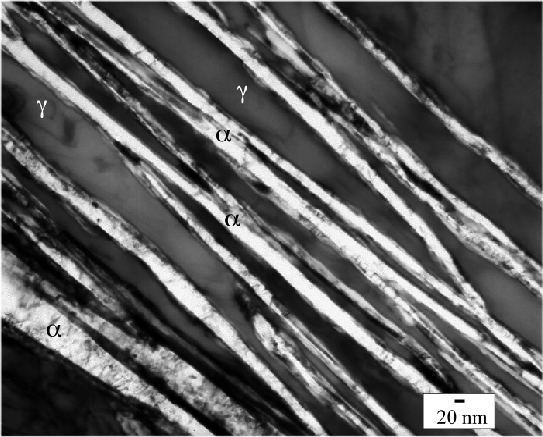 It has been possible for some time to obtain commercially, steel wire which has an ultimate tensile strength of 5.5 GPa and yet is very ductile in fracture [29,30,31]. Scifer, as the wire is known, is made by drawing a dual-phase microstructure of martensite and ferrite in Fe-0.2C-0.8Si-1Mn wt% steel in the form of 10 mm diameter rods, into strands which individually have a diameter of about 8 m. This amounts to a huge deformation with a true strain in excess of 9. The dislocation cell size in the material becomes about 10-15 nm in size (Fig. 4a). This is where much of the strength of Scifer comes from [30,31]. A similar stainless steel thread is also available commercially . The fact that the properties are here achieved by introducing defects, also means that the strength of Scifer is insensitive to its size as shown in Fig. 4b. Figure: (a) Field-ion microscope image of Scifer  showing the very fine dislocation cell structure. 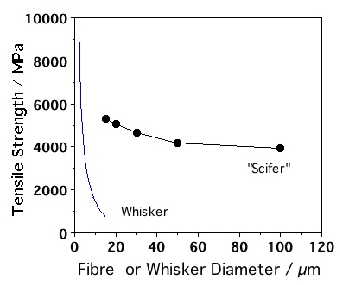 (b) Comparison of the size-sensitivity of single-crystals whiskers of iron and Scifer. (c) Sock made using 50 denier yarn. A denier is the weight in grams of 9 km of fibre or yarn. 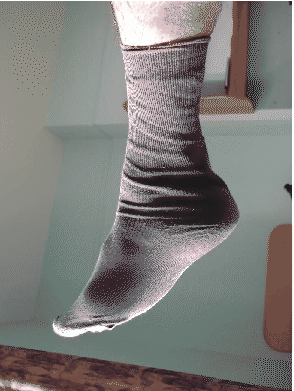 A 50 denier thread is typically used in making socks whereas stockings are made from 10 denier fibre. Scifer is just 9 denier in this classification; this highlights one of the difficulties in using deformation to increase strength. The deformation necessary to accumulate a large number density of defects limits the size and form of the product, in the case of Scifer to that of a textile thread. Deformation processes such as equichannel angular processing [33,34] and accumulative roll-bonding [35,36] maintain the overall dimensions but the range of shapes that can be achieved is limited. Statement 3: The properties of severely deformed materials are insensitive to size but the forms that can be produced are limited. High-strength low-alloy steels produced using thermomechanical processing have been described as one of the wonders of the world . They have contributed so much to the quality of engineered products that tens of billions of tonnes of such alloys now permeate all aspects of life. During the processing, fine austenite grains are generated by a combination of deformation and recrystallisation; the austenite finally transforms into fine grains of ferrite , with a size typically of 10 m. The recent search has been for processes which reduce the grain size dramatically to less than 1 m [38,39,40]. Fine grains represent one of the few mechanisms available to increase both strength and toughness. What then is the theoretical minimum grain size that can be achieved using this technology? This question can be answered by noting that the excess energy stored in the form of grain boundaries cannot exceed the free energy change due to the transformation of the austenite . This relationship would have to be modified when the austenite is pancaked prior to transformation and there are other details such as crystallographic texture which need to be taken into account . 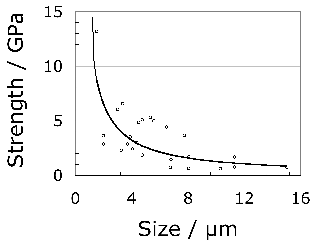 Figure 5 shows the variation in the limiting ferrite grain size as a function of , calculated using equation 5 with Jm ; given the absence of data the term in equation 6 was set to zero. These calculations are presented as the `ideal' curve in figure 5. 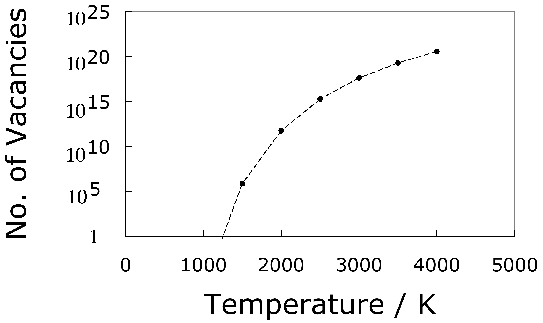 The curve indicates that at large grain sizes, is sensitive to and hence to the undercooling below the equilibrium transformation temperature. However, reductions in grain size in the submicrometre range require huge values of , meaning that the transformations would have to be suppressed to large undercoolings to achieve fine grain size. 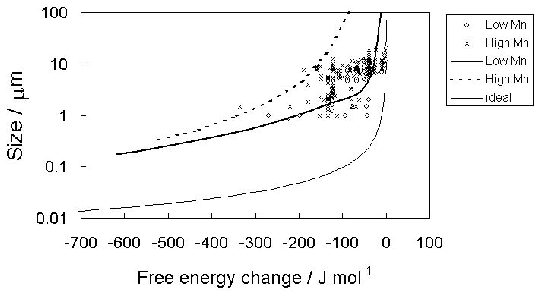 Figure: Plot of the logarithm of ferrite grain size versus the free energy change at . The ideal curve represents the values of . The points are experimental data; in some cases it is assumed that the grain size quoted in the literature corresponds to the mean lineal intercept. The curves marked low and high-Mn represent calculated values of after allowing for recalescence . Also plotted on Fig. 5 are points corresponding to measured ferrite grain sizes from the low and high-Mn steels as described elsewhere ; It is evident that except at the lowest undercoolings, . 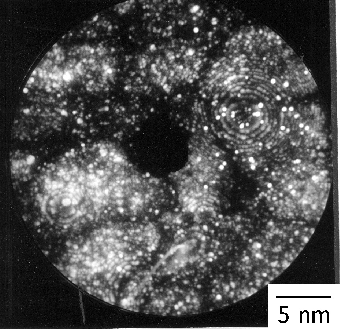 The data indicate that in spite of tremendous efforts, the smallest ferrite grain size obtained commercially using thermomechanical processing is stuck at about 1 m.
The reason for this is recalescence, which is the heating of the sample caused by release of the latent heat of transformation at a rate which is so high that it cannot easily be dissipated by diffusion. This rise in temperature due to recalescence reduces the effective undercooling and hence the driving force for transformation . It is seen from Fig. 5 that the recalescence-corrected curves show better agreement with the experimental data, indicating that at large undercoolings, the achievement of fine grain size is limited by the need to dissipate enthalpy during rapid transformation. To achieve submicrometre grain sizes it is necessary to transform at large undercoolings, but the rate of transformation then increases, leading to recalescence, which defeats the objective. Large scale thermomechanical processing is therefore limited by recalescence and it is unlikely to lead to grain sizes which are uniformly less than about 1 m.
Statement 4: To achieve submicrometre grain sizes it is necessary to transform at large undercoolings, but the rate of transformation then increases, leading to recalescence, which defeats the objective. Large scale thermomechanical processing is therefore limited by recalescence and is unlikely to lead to grain sizes which are uniformly less than about 1 m.
Very strong martensitic steels with strength greater than 3 GPa already exist . This kind of martensite is produced in fairly large steel samples by rapid cooling from the austenitic condition. However, the dimensions can be limited by the need to achieve a uniform microstructure, a fact implicit in the original concept of hardenability. To increase hardenability requires the addition of expensive alloying elements. The rapid cooling can lead to undesirable residual stresses [43,44] which can ruin critical components and which have to be accounted for in component-life assessments. The material must not rely on perfection to achieve its properties. Strength can be generated by incorporating a large number density of defects such as grain boundaries and dislocations, but the defects must not be introduced by deformation if the shape of the material is not to be limited. Defects can be introduced by phase transformation, but to disperse them on a sufficiently fine scale requires the phase change to occur at large undercoolings (large free energy changes). A strong material must be able to fail in a safe manner. It should be tough. Recalescence limits the undercooling that can be achieved. Therefore, the product phase must be such that it has a small latent heat of formation and grows at a rate which allows the ready dissipation of heat. Steel transformed into carbide-free bainite can satisfy these criteria. Bainite and martensite are generated from austenite without diffusion by a displacive mechanism. Not only does this lead to solute-trapping but also a huge strain energy term, both of which reduce the heat of transformation [45,46,47]. The growth of individual plates in both of these transformations is fast, but unlike martensite, the overall rate of reaction is much smaller for bainite. This is because the transformation propagates by a sub-unit mechanism in which the rate is controlled by nucleation rather than growth . This mitigates recalescence. Suppose we now attempt to calculate the lowest temperature at which bainite can be induced to grow. We have the theory to address this proposition [49,50,51,52,53]. 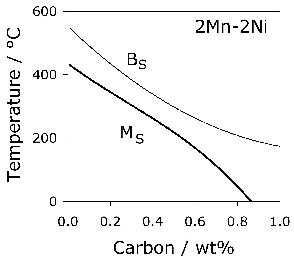 Such calculations are illustrated in Figure 6a, which shows for an example steel, how the bainite-start ( ) and martensite-start ( ) temperatures vary as a function of the carbon concentration. There is in principle no lower limit to the temperature at which bainite can be generated. On the other hand, the rate at which bainite forms slows down drastically as the transformation temperature is reduced, as shown by the calculations in Figure 6b. It may take hundreds or thousands of years to generate bainite at room temperature. For practical purposes, a transformation time of tens of days is reasonable. But why bother to produce bainite at a low temperature? Figure: (a) Calculated transformation start temperatures in Fe-2Si-3Mn steel as a function of the carbon concentration. (b) The calculated time required to initiate bainite at the temperature . It is well known that the scale of the microstructure, i.e., the thickness of the bainite plates, decreases as the transformation temperature is reduced [46,55]. This is because the yield strength of the austenite becomes greater at lower temperatures, thereby affecting the plastic accommodation of the shape deformation accompanying bainite growth, and presumably because the nucleation rate can be greater at larger undercoolings. The strength of the microstructure scales with the inverse of the plate thickness, thus providing a neat way of achieving strength without compromising toughness. Experiments consistent with the calculations illustrated in Figure 6 demonstrated that in a Fe-1.5Si-2Mn-1C wt% steel (detailed composition in Table 3), bainite can be generated at a temperature as low at 125 C , which is so low that the diffusion distance of an iron atom is an inconceivable 10 m over the time scale of the experiment! What is even more remarkable is that the plates of bainite are only 20-40 nm thick. The slender plates of bainite are dispersed in stable carbon-enriched austenite which, with its face-centred cubic lattice, buffers the propagation of cracks. The optical and transmission electron microstructures are shown in Fig. 7; they not only have metallurgical significance in that they confirm calculations, but also are elegant to look at. Indeed, the microstructure has now been characterised, both chemically and spatially to an atomic resolution; the pleasing aesthetic appearance is maintained at all resolutions. There is no redistribution of substitutional atoms on the finest conceivable scale . Ultimate tensile strengths of 2500 MPa in tension have routinely been obtained, ductilities in the range 5-30% and toughness in excess of 30-40 . All this in a dirty steel which has been prepared ordinarily and hence contains inclusions and pores which would not be there when the steel is made by any respectable process. The bainite is also the hardest ever achieved, 700 HV . The simple heat treatment involves the austenitisation of a chunk of steel (at say 950 C), gently transferring into an oven at the low temperature (at say 200 C) and holding there for ten days or so to generate the microstructure. There is no rapid cooling - residual stresses are avoided. The size of the sample can be large because the time taken to reach 200 C from the austenitisation temperature is much less than that required to initiate bainite. Our tests indicate uniform microstructure in 80 mm thick samples - thicker samples were not available but calculations indicate that dimensions greater than 200 mm will show similar results. This is a major commercial advantage . It is cheap to heat-treat something at temperatures where pizzas are normally cooked. But suppose there is a need for a more rapid process. The transformation can easily be accelerated to occur within hours, by adding solutes which decrease the stability of austenite. Aluminium and cobalt, in concentrations less than 2 wt%, have been shown to accelerate the transformation in the manner described. Both are effective, either on their own or in combination . Table: Typical chemical compositions of hard bainite. The silicon is added to prevent cementite formation during the growth of bainite, the molybdenum to counter embrittlement due to impurities such as phosphorus, the manganese and chromium for hardneability and the cobalt and aluminium to accelerate the transformation. The substitutional solute also contribute to hardenability and determine the curve which is vital in the design of carbide-free bainitic steels [62,63]. Much of the strength and hardness of the microstructure comes from the very small thickness of the bainite plates. 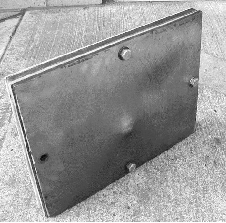 Of the total strength of 2500 MPa, some 1600 MPa can be attributed solely to the fineness of the plates. The residue of strength comes from dislocation forests, the strength of the iron lattice and the resistance to dislocation motion due to solute atoms. Because there are many defects created during the growth of the bainite , a large concentration of carbon remains trapped in the bainitic ferrite and does not precipitate, probably because it is trapped at defects . 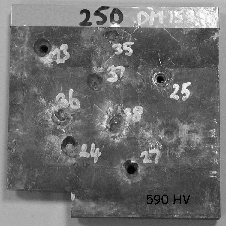 Whereas the ordinary tensile strength of the strong bainite is about 2.5 GPa, the strength has been reported to be as high as 10 GPa at the very high strain rates ( ) associated with ballistic tests illustrated in Fig. 8 . The strong bainite has therefore found application in armour [67,68]. Fig. 9 shows a series of tests conducted using projectiles which are said to involve ``the more serious battlefield tests" (the details are proprietary). Figs. 9a,b show experiments in which an armour system is tested. 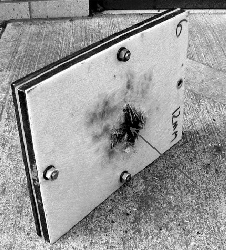 A 12 mm thick sample of the bainitic steel is sandwiched between vehicle steel, the whole contained in glass-reinforced plastic. In ordinary armour the projectile would have penetrated completely whereas the bainite has prevented this; the steel did however crack. By reducing the hardness (transforming at a higher temperature), it was possible for the armour to support multiple hits (Fig. 9c) without being incorporated in an armour-system. Figure: Ballistic test on the bainitic armour alloys . 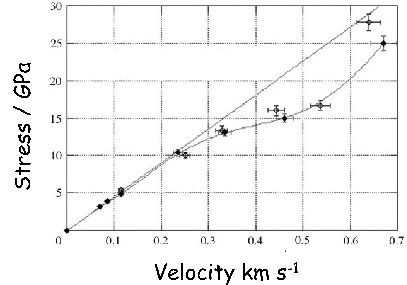 Departure from the straight line indicates plasticity and the horizontal axis represents projectile velocity. Fig. 9d shows that the BME of the strong bainite exceeds titanium armour and compares with the alumina . Figure: Fe-0.98C-1.46Si-1.89Mn-0.26Mo-1.26Cr-0.09V wt%, transformed at 200 C for 5 days. (a) 12 mm thick sample of bainite between two plates of ordinary vehicle armour, with a layer of glass-reinforced plastic. Arrow indicates the path of the projectile. (b) Rear view, showing lack of penetration. (c) Lower hardness bainitic armour - remains intact following multiple hits. (d) Comparison of armours. After D. Crowther and P. Brown. High-carbon steels are difficult to weld because of the formation of untempered, brittle martensite in the coarse-grained heat-affected zones of the joints. The martensite fractures easily, leading to a gross deterioration in the structural integrity of the joint. For this reason, the vast majority of weldable steels have low carbon concentrations. It would be desirable therefore to make the low-temperature bainite with a much reduced carbon concentration. 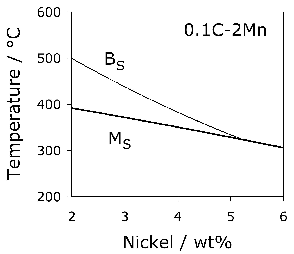 Figure: Calculated bainite and martensite-start temperatures: (a) Fe-0.1C-2Mn wt%, with a variation in nickel concentration; (b) Fe-2Ni-2Mn with a variation in the carbon concentration . Calculations done using the scheme outlined elsewhere [49,69] indicate that carbon is much more effective in maintaining a difference between the and temperatures than are substitutional solutes which reduce simultaneously for martensite and bainite, Fig. 10. Substitutional solutes do not partition during any stage in the formation of martensite or bainite; both transformations are therefore identically affected by the way in which the substitutional solute alters the thermodynamic driving force. It is the partitioning of carbon at the nucleation stage which is one of the distinguishing features of bainite when compared with martensite. This carbon partitioning allows bainite to form at a higher temperature than martensite. This advantage is diminished as the overall carbon concentration is reduced, as illustrated in Figure 10. From these results, it must be concluded that it is not possible to design low-temperature bainite with a low carbon concentration. The ultimate focus of this lecture has been the ability to make large chunks of strong and tough steel. But it has been necessary to place this in the wider context of strong materials in order to allow sensible comparisons to be made. When claims are made about strong materials for structural applications, they seem frequently to neglect the elementary science of scale. Just because it is possible to produce a nanotube of carbon which has a calculated strength of 130 GPa and a measured strength approaching that value, it does not mean that this can be translated into a fibre of a length visible to the naked eye, let alone the 120,000 km needed to begin thinking about a space-elevator. Indeed, it may not be possible even in principle to scale the properties given the existence of entropy-stabilised equilibrium defects. It is noticeable in the contemporary materials literature that strength is a term which is much abused. It is common to claim that a novel material is as strong as steel, without specifying the nature of the steel against which the comparison is made. The claimants are either ignorant of the fact that it is possible to commercially make polycrystalline iron with a strength as low as 50 MPa or as high as 5.5 GPa, or neglect it to impress a fickle audience. In an academic context, single crystals of iron have been made which behave elastically to a stress of 14 GPa, taking them into a range of recoverable strain where Hooke's law does not apply. Statement 5: The bainite obtained by transformation at very low temperatures is the hardest ever, has considerable ductility (almost all of it uniform), does not require mechanical processing, does not require rapid cooling, the steel after heat-treatment therefore does not have long-range residual stresses, it is very cheap to produce and has uniform properties in very large sections. In effect, the hard bainite has achieved all of the essential objectives of structural nanomaterials which are the subject of so much research BUT IN LARGE CHUNKS! There remain, as is always the case, many parameters which have yet to be characterised, for example the fatigue and stress-corrosion properties. I am grateful to M. Endo for providing the images of the graphene and the schematic illustration of the graphene to nanotube transition. It is an especial pleasure to acknowledge Francisca Garcia Caballero for the original work on hard bainite. I would also like to thank Carlos Garcia Mateo, Mathew Peet, Kazu Hase, Suresh Babu, Mike Miller, Peter Brown, David Crowther and others who continue to contribute to the subject. G. F. Taylor, Phys. Rev., 23, 1924, 655-660. C. Herring and J. K. Galt Phys. Rev., 85, 1952, 1060-1062. G. W. Sears, A. Gatti and R. L. Fullman, Acta Metall., 2, 1954, 727-728. W. W. Piper and W. L. Roth Phys. Rev., 92, 1953, 503-503. S. S. Brenner, Acta Metall., 4, 1956, 62-74. R. L. Eisner, Acta Metall., 3, 1955, 414-419. S. S. Brenner, J Appl. Phys., 27, 1956, 1484-1491. J. Frenkel, Z. Phys., 37, 1926, 572-609. A. H. Cottrell, European Review, 1, 1993, 169-176. G. R. Speich, A. J. Schwoeble and W. C. Leslie, Metallurgical Transactions, 3, 1972, 2031-2037. B. C. Edwards, Acta Astronautica, 47, 2000, 735-744. D. V. Smitherman, Jr., NASA Space Flight Centre Report NASA/CP-2000-210429, An advanced earth-space infrastructure for the new millenium, Huntsville, Alabama, 2000, 1-48. A. Oberlin, M. Endo and T. Koyama, Journal of Crystal Growth, 32, 1976, 335-349. H. W. Kroto, J. R. Heath, S. C. O'Brien, R. F. Curl and R. E. Smalley, Nature, 355, 1985, 162-163. S. Iijima, Nature, 354, 1991, 56-58. M. Endo, T. Hayashi, Y. A. Kim, M. Terrones and M. S. Dresselhaus, Phil. Trans. R. Soc. Lond. A, 362, 2004, 2223-2238. H. Terrones, M. Terrones, F. López-Urías, J. A. Rodríguez-Manzo and A. L. Mackay, Phil. Trans. R. Soc. Lond. A, 362, 2004, 2039-2063. M. S. Dresselhaus, G. Dresselhaus, J. C. Charlier and E. Harnández, Phil. Trans. R. Soc. Lond. A, 362, 2004, 2065-2098. E. W. Wang, P. E. Sheehan and C. M. Lieber, Science, 277, 1997, 1971-1975. J. P. Lu, J. Phys. Chem. Solids, 58, 1997, 1649-1652. S. L. Mielke, D. Troya, S. Zhang, J.-L. Li, S. Xiao, R. Car, R. S. Ruoff, G. C. Schatz and T. Belytschko, Chemical Physics Letters, 390, 2004, 413-420. B. I. Yakobson and R. E. Smalley, American Scientist, 85, 1997, 324-337. A. J. Stone and D. J. Wales, Chemical Physics Letters, 128, 1986, 501. J. W. Christian, Theory of Transformations in Metals and Alloys, Part I, 2nd edition, Pergamon Press, Oxford, 1975. B. G. Demczyk, Y. M. Wang, J. Cumings, M. Hetman, W. Han, A. Zettl and R. O. Ritchie, Materials Science and Engineering, 334A, 2002, 173-178. M.-F. Yu, O. Lourie, M. J. Dyer, K. Moloni, T. F. Kelly, R. S. Rouff, Science, 287, 2000, 637-640. S. Xie, W. Li, Z. Pan, B. Chang and L. Sun, Journal of Physics and Chemistry of Solids, 61, 2000, 1153-1158. Z. W. Pan, S. S. Xie, L. Lu, B. H. Chang, L. F. Sun, W. Y. Zhou, G. Wang and D. L. Zhang, Applied Physics Letters, 74, 1999, 3152-3154. Anonymous, Kobelco Technology Review No. 8, Kobe Steel Ltd., Japan, June 1990. H. K. D. H. Bhadeshia, Future Developments in Metals and Ceramics, eds J. A. Charles, G. W. Greenwood and G. C. Smith, Institute of Materials, London, (1992) 25-73. H. K. D. H. Bhadeshia and H. Harada, Applied Surface Science, 67, 1993, 328-333. 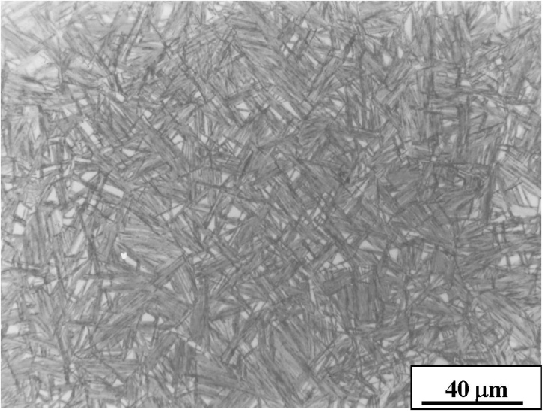 H.-S. Wang, J. R. Yang and H. K. D. H. Bhadeshia, Materials Science and Technology, 2005, in press. R. Z. Valiev, R. K. Islamgaliev, I. V. Alexandrov, Progress in Materials Science, 45, 2000, 103-189. V. M. Segal, Materials Science and Engineering, 338A, 2002, 331-344. Y. Saito, N. Tsuji, H. Utsunomiya, T. Sakai and R. J. Hone, Scripta Materialia, 39, 1998, 1221-1227. N. Tsuji, Y. Saito, H. Ustunomiya and S. Tanigawa, Scripta Materialia, 40, 1999, 795-800. K. Easterling, Tomorrow's Materials, The Institute of Materials, London, 1988. D. P. Harvey, R. Kalyanaraman, T. S. Sudarshan, Materials Science and Technology, 18, 2002, 959-963. Z. Horita, M. Furukawa, M. Nemoto and T. G. Langdon, Materials Science and Technology, 16, 2000, 1239-1245. R. Priestner and A. K. Ibraheem, Materials Science and Technology, 16, 2000, 1267-1272. T. Yokota, C. Garcia-Mateo and H. K. D. H. Bhadeshia, Scripta Materialia, 51, 2004, 767-770. E. Hornbogen, Innovations in Ultrahigh-Strength Steel Technology, eds G. B. Olson, M. Azrin and E. S. Wright, 34th Sagamore Army Conference, USA, 1987, 113-126. P. J. Withers and H. K. D. H. Bhadeshia, Materials Science and Technology, 17, 2001, 355-365. P. J. Withers and H. K. D. H. Bhadeshia, Materials Science and Technology, 17, 2001, 366-375. J. W. Christian, Proc. Int. Conf. on Martensitic Transformations, ICOMAT `79, ed M. Cohen, MIT Press, Boston, USA, pp. 220-234. H. K. D. H. Bhadeshia, Bainite in Steels, 2nd edition, IOM Communications, London, 2002. H. K. D. H. Bhadeshia, Materials Science Forum, 284-286, 1998, 39-50. H. Matsuda and H. K. D. H. Bhadeshia, Proceedings of the Royal Society of London, - A 460, 2004, 1710-1722. H. K. D. H. Bhadeshia, Acta Metallurgica, 29, 1981, 1117-1130. H. K. D. H. Bhadeshia, Metal Science, 15, 1981, 175-177. H. K. D. H. Bhadeshia, Metal Science 15, 1981, 178-180. G. Ghosh and G. B. Olson, Journal of Phase Equilibria, 22, 2001, 199-207. C. G. Mateo and H. K. D. H. Bhadeshia, Materials Science and Engineering A 378A, 2004, 289-292. H. K. D. H. Bhadeshia, Metal Science, 16, 1982, 159-165. S. B. Singh and H. K. D. H. Bhadeshia, Materials Science and Engineering A, 245A, 1998, 72-78. C. Garcia-Mateo, F. G. Caballero, H. K. D. H. Bhadeshia, ISIJ International, 43, 2003, 1238-1243. M. Peet, S. S. Babu, M. K. Miller and H. K. D. H. Bhadeshia, Scripta Materialia 50, 2004, 1277-1281. H. K. D. H. Bhadeshia, Millenium Steel, 5, 2004, 25-28. C. Garcia-Mateo, F. G. Caballero, and H. K. D. H. Bhadeshia, ISIJ International, 43, pp. 1821-1825, 2003. H. K. D. H. Bhadeshia and D. V. Edmonds, Metal Science, 17, 1983, 411-419. H. K. D. H. Bhadeshia and D. V. Edmonds, Metal Science, 17, 1983, 420-425. F.G. Caballero and H.K.D.H. Bhadeshia, Current Opinion in Solid State and Materials Science, 8, 2004, 251-257. M. Peet, C. Garcia-Mateo, F. G. Caballero and H. K. D. H. Bhadeshia, Materials Science and Technology, 20, 2004, 814-818. R. I. Hammond and W. G. Proud, Proceedings of The Royal Society of London, A460, 2004, 2959-2974. D. Crowther and Brown, P. M., private communication, 2004. P. M. Brown and D. P. Baxter, ``Hyper-strength bainitic steels", Materials Science and Technology 2004, New Orleans, Louisiana, (2004) 433-438. H. K. D. H. Bhadeshia, Proc. Int. Conf. Phase Transformations 2005, TMS, Warrendale, USA, 2005, in press. C. Garcia-Mateo, F. G. Caballero, H. K. D. H. Bhadeshia, ISIJ International, 43, 2003, 1821-1825. Here we do not mean conformal defects such as the Stone-Wales configurations which become stable and mobile under stress . Rather, we refer to defects which are in principle stable in a stress-free tube and remain so under the influence of load.